As you know, every language has its own collection of wise sayings. They offer advice about how to live and also transfer some underlying ideas, principles and values of a given culture / society. These sayings are called Â« idioms Â» â€“ or proverbs if they are longer. These combinations of words have (rarely complete sentences) a Â« figurative meaning Â»and they basically work with Â« pictures Â». A good List of commonly used idioms and sayings (in everyday conversational English), can help to speak English fluently by learning English idiomatic expressions. This is the list we studied in 2010 â€“ 2011. 1. TO BARK UP THE WRONG TREE. It means to make a mistake or to make the wrong choice; to ask the wrong person; to follow the wrong course. ( It alludes to a dog in pursuit of an animal, where the animal is in one tree and the dog is barking at another tree.). Example: If you think I'm guilty, you're barking up the wrong tree. 2. TO CALL A SPADE A SPADE. It means is to speak honestly and directly about a topic. To be outspoken, to be blunt. The word spade refers to the instrument used to move earth, a very common tool. Example: Let's call a spade a spade â€“ Stephen is a very stupid student. 3. ON A SHOE STRING. If you do something on a shoestring, you do it using very little money. Example: John travelled to London on a shoestring. 4. THE PROOF OF THE PUDDING IS IN THE EATING. "Results are what count...it's not how you start, but how you finish." Example: Go ahead - talk all you want about your wonderful recipe and its fine ingredients, but ultimately the proof is in the pudding. 5. TO PAINT THE TOWN RED. It means: To go out and have a good a time. Usually requiring the aid of alcohol or other mind altering substances. It is indeed usually said about celebrations that include a lot of drinkingIts origin: The phrase comes from an Englishman Lord Waterford, who in 1837, when celebrating a successful fox hunt, got so drunk with his friends that they literally found several tins of red paint which they daubed liberally on to the buildings of the High Street of Melton Mowbray so originating the phrase "painting the town red". Example: John: "Do you want to go and paint the town red tonight?" Pete: "Well, I'd love to because I had such a stressful week." 6. TO HAVE OTHER FISH TO FRY. It means to have more important matters to attend to, more important things to do. Example: They asked me to help with the Christmas decorations, but I said no because I have other fish to fry. 7. IT'S IN THE PIPELINE. If something's in the pipeline, it hasn't arrived yet but its arrival is expected. if a plan is in the pipeline, it is being developed and will happen in the future. Example: We have several major property deals in the pipeline. 8. TO BE CAUGHT RED-HANDED. If you are caught red-handed you are discovered in the middle of committing a crime or doing something wrong. Criminals can be caught red-handed by the police at the scene of their crimes and children can be caught red-handed by their parents committing some minor misdemeanour like taking food from the fridge in the middle of the night. The origin : For many centuries it was not considered to be proof of guilt if someone was in possession of meat from another manâ€™s animal. It was impossible to prove that they were guilty under such circumstances. If, on the other hand, they had the blood of a freshly killed animal on their hands this was incontrovertible proof of guilt. In those days being caught red-handed usually meant a death sentence. Example : He was â€‹caught â€‹red-handed taking â€‹money from the till. 9. TO KICK THE BUCKET. It means to lose one's life, to die. 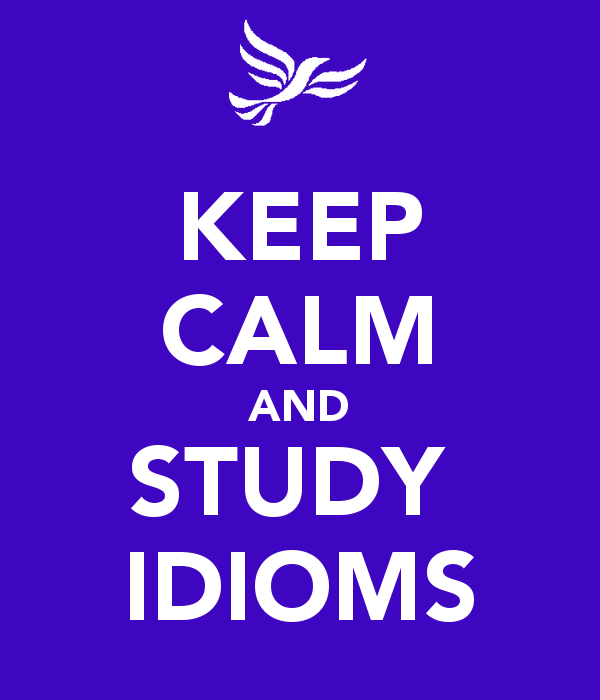 As often for idioms, its origin remains unclear, though there have been several theories. One of my favourite is this one: this idiom would come from a method of execution such as hanging, or perhaps suicide, in the Middle Ages. A noose is tied around the neck while standing on an overturned bucket. When the pail is kicked away, the victim is hanged. Example: Did you know that old Mr. Smith kicked the bucket last week? 10. TO BE IN A QUANDARY. Example: Last year I was in a quandary about what university to go to. I couldn't decide what to do. 11. THE WORLD IS MY OYSTER. If the world is your oyster, you have the ability and the freedom to do anything or go anywhere. You're young and healthy and you've got no commitments, so the world is your oyster. In this term the oyster is something from which to extract great profit (a pearl).This idiom was probably invented by Shakespeare in The Merry Wives of Windsor (2:2)"Why then, the world's mine oyster, which I with sword will open." Example: The world is my oyster! I'm in love! 12. TO JUMP ON THE BANDWAGON. If people jump on the bandwagon, they get involved in something that has recently become very popular. They profit from a craze; they join a trend. The expression 'jump on the bandwagon' most likely entered popular lingo during the middle of the 19th Century, as a reference to the colourful bandwagon used during pre-circus parades through host cities. Band members rode at the top of these carriages, accompanied by other performers or privileged local citizens. Jumping on the bandwagon soon became shorthand for supporting a popular cause or political candidate because of a herd mentality or superficial attraction. Example: After the incredible success of Cadbury's latest low-fat chocolate bar, NestlÃ© has jumped on the bandwagon, and released a low-fat version of Kit Kat. 13. TO HAVE ITCHY FEET. It means to want to travel or to do something different. You get itchy feet when you have been in one place for a time and you want to travel. Example : It's no wonder John's got itchy feet. He's been doing the same job, in the same office, for nearly twenty years. 14. TO WORK YOUR FINGERS TO THE BONE. It means to work very very hard. A person who works their fingers to the bone is extremely hardworking. The first hyperbole, with its image of working the skin and flesh off one's fingers, dates from the mid-1800s. Example: I spent the day working my fingers to the bone, and now I want to relax. 15. TO PUT YOUR SHOULDER TO THE WHEEL. When you put your shoulder to the wheel, you contribute to an effort. You start doing something with all your energy and determination. Example: We need to put our shoulders to the wheel if we want to finish this on time.